Trigeminal Neuralgia Treatment: Trigeminal neuralgia, or tic douloureux, is a facial pain condition that affects the trigeminal or 5th cranial nerve. It is characterized by unilateral (one sided) facial pain that is severe, sporadic, sudden, burning or shock-like. It can affect the areas of the face including the upper jaw, lower jaw, eye, nose, scalp, lip, ear, and forehead. 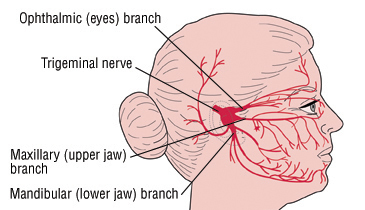 Trigeminal neuralgia affects women more often than men, and it’s more likely to occur in people who are older than 50. The intensity of pain can be both physically and mentally incapacitating. Sensory stimulation such as the wind blowing on the face, cold air, touch, talking, or eating can trigger an attack. Neck flexion can also trigger an attack in some patients so proper biomechanics are important. The anxiety of not knowing when an attack may come on can cause anxiety, depression and suicide, thus the name the “Suicide Disease”. It is thought that Trigeminal Neuralgia pain can come from multiple sclerosis; nerve compression from a tumor; injury to the trigeminal nerve due to sinus or oral/dental surgery; stroke, or facial trauma, but no one knows for certain as pain usually comes on out of the blue. Trigeminal neuralgia diagnosis is based primarily on the patient’s symptoms along with physical and neurological examination. Most patients will undergo a magnetic resonance imaging (MRI) scan to rule out a tumor or multiple sclerosis as the cause of their pain. Other disorders that cause facial pain should be ruled out before trigeminal neuralgia is diagnosed. Some disorders that cause facial pain include temporomandibular joint disorder, post-herpetic neuralgia and cluster headaches. Medical options include drugs and surgery, but unfortunately for most Trigeminal Neuralgia patients medical treatment is not very successful and there are side effects, but fortunately there are other options. Dr. Snyder uses a non-invasive FDA cleared Class IV Laser Therapy for Trigeminal Neuralgia Treatment. Class IV Laser Therapy a.k.a. High Power Laser Therapy targets the source of your pain with no harmful side effects and the treatments are completely painless. Laser Therapy bio-stimulates the cells to help reduce pain, swelling and inflammation. Laser Therapy increases circulation and accelerates the rate of healing and pain relief. Proper laser therapy protocol (wattage, time, frequency) are the keys to getting a reduction in pain levels. Some Trigeminal Neuralgia patients may have Temporal Mandibular Joint Disorder. The TMJ should be evaluated for deviation upon jaw closure as well as tenderness on both sides of the jaw. Chiropractic adjustments to the misaligned jaw may be needed to realign the TMJ. If there is TMJ dysfunction, the patient should avoid yelling, taking large bites, avoid chewing gum, eat soft foods, and sleep on their back with nose pointed up. If tolerable ice may give relief in those Trigeminal Neuralgia patients that can tolerate cold temperatures. In some patients it is even helpful to tie a bandage around head and keep the jaw shut for as much as possible throughout the day. The mid to upper cervical spine should also be evaluated for subluxations/misalignments that may be the cause of the Trigeminal Neuralgia pain. Forward Head Posture (FHP), a condition in which the patient has poor posture and the head sits out in front of the body should also be considered as neck flexion commonly exacerbates the symptoms. A thermography instrument or temperature differential device should be used by the chiropractor and watched closely to help monitor the frequency of adjustments as well as the correct vertebral level involved. Problems in these areas may require specific Gonstead Chiropractic adjustments as well as soft tissue work such as Active Release Technique. Patients should sleep in an anatomical position on their back with no more than 1 small pillow and try to maintain good posture and biomechanics throughout the day. In addition an anti-inflammatory diet should be considered. Reducing or eliminating sugars, gluten, trans fats, dairy, commercially produced meats, alcohol, refined grains, artificial food additives and any food that YOU and only YOU may be sensitive (allergic) to. Certain foods can be re-introduced one at a time at a later date. If you would like to talk to Dr. Snyder about Trigeminal Neuralgia Treatment, please make an appointment today for a complimentary consultation in his Newport Beach, CA office.